The Tobacco Free Partnership of Okeechobee County is a coalition of community members actively working to change the perception among local youth that tobacco use is a normal activity. The group consists of a wide array of adults from both the public and private sector, local youth leaders, and members of the general public. 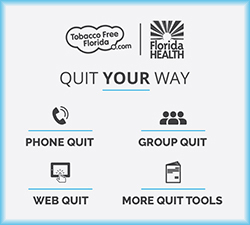 The work of the Partnership is supported by a Community-Based Tobacco Prevention Grant through the Florida Department of Health / Tobacco Free Florida. 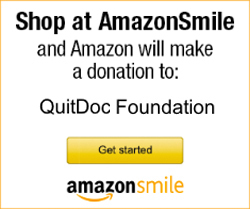 The local fiscal agent for the Partnership is the QuitDoc Foundation. The Tobacco Free Partnership of Okeechobee County coordinates tobacco prevention efforts throughout Okeechobee County. The primary goal of the group is to create local tobacco-free policies. Such policy change does not occur overnight. There is a huge educational component that is required to foster policy change. The Tobacco Free Partnership conducts a wide variety of community outreach and educational programs designed to explain the importance... and the need... for new, stricter tobacco free policies. The Partnership also fosters youth involvement. Using tobacco control as the model, the Partnership raises youth leaders from local schools and youth organizations. These leaders help to drive the policy change by providing some of the community outreach and educational programs. The current Parnership Facilitator is Courtney Moyett. The Tobacco Free Partnership of Okeechobee County will be electing new leadership during the summer of 2015. That information will be posted here as soon as it becomes available. You can also read our current by-laws by clicking here. "The mission of the Tobacco Free Partnership of Okeechobee County is to mobilize community partners to establish long-lasting system and policy changes that promote tobacco-free social norms in order to prevent usage of tobacco products by youth/young adults, encourage and support tobacco cessation, eliminate the hazards of secondhand smoke, and decrease the number of deaths due to tobacco products."